To combat many workplace issues, we create “Work Zones” and rotate between them throughout the day. These zones help us to stay productive and check a few items off of our daily fitness list. Today’s topic is a fun one. Partially because it is something that I am sure that we can all agree on but mostly because for the first time in quite a while we have a guest hero! Guest heroes, actually. Vanessa and Adam Lambert from Bee The Wellness. No, I am talking about spaces around your home, your office or wherever you get your work done, where you can vary your stance, extend your gaze, vary your movement, and even other biomarkers like your body temperature, to keep from getting what Adam will refer to later as “cabin fever” while you are at work. Before I continue, let’s step into the email zone for a minute… heh. 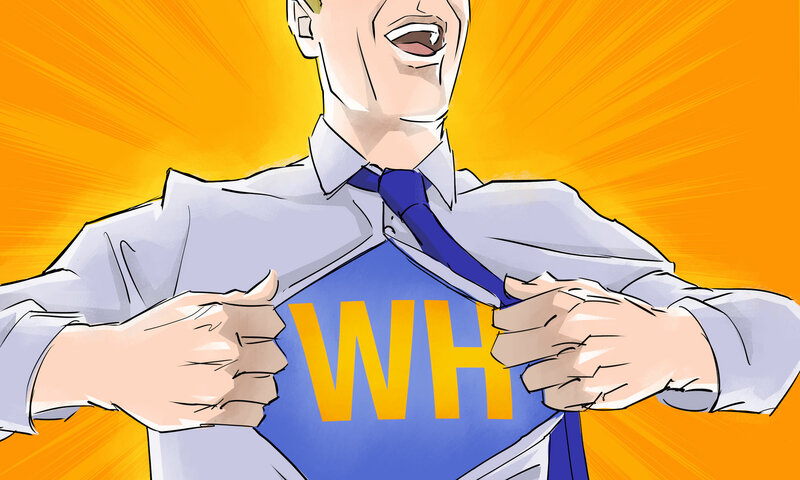 I would love it if you signed up for the Workplace Hero email newsletter over at workplacehero.me. The sign up form is on the righthand side of the page. Because I believe so strongly in the idea of Inbox Zero, I promise that you will only receive an email once per week, and it will be short, to the point and easy to delete. Plus, just for signing up, you will receive a coupon code for 10% off at the online health and fitness store, GreenfieldFitnessSystems.com. Over there they have a huge array of supplements, gear, plans, coaches and clothing that will help keep you healthy and fit. So sign up for the newsletter at workplacehero.me and get your discount code for GreenfieldFitnessSystems.com now. Ok. Let’s meet our guest heroes. Hi We are Adam and Vanessa Lambert owners of Bee The Wellness. We have been in the health and fitness business for nearly 20 years and as holistic wellness coaches we focus on the complete picture, including strength and conditioning, nutrition, mindfulness, and adventure. Since creating Bee The Wellness we have helped thousands of people adopt a healthier lifestyle as well create expanded lives through our remote coaching programs and retreats. They also have a great podcast that you can find on iTunes or wherever you listen to podcasts. Just search for Bee (that’s with two Es) The Wellness or go to beethewellness.com and give it a try. A good episode to start with would be the one where they interviewed me! Ha ha… as if you don’t get enough of me already. Anyway. When I asked Vanessa and Adam what issues they saw cropping up in their clients as a direct result of their workspaces, this is what they told me. As the majority of our work for Bee The Wellness takes place out of our house or on the road and includes a ton of computer time we have identified three issues that cause us the most grief and negatively impact our productivity. 1. Eye strain – Frequent laptop and mobile device sessions can have our gaze fixed at one distance for hours if we don’t take action. 2. Lack of movement – When you get out of bed and then you are at work all day you miss out on several opportunities to move. Think walking to your car, walking up the stairs in your office, and running whatever errands you have to do. 3. Boredom/ fatigue – Similar to #2 being in the same space morning noon and night can seriously affect our ability to stay focused. It’s like having cabin fever and can sneak up pretty quickly if you don’t get a change of scenery. To combat these issues we create work zones and rotate between them throughout the day. These zones help us to stay productive and check a few items off of our daily fitness list. I don’t think any of us can argue with any of those issues. In my experience they are all quite ubiquitous in our modern work life. I for one have been experiencing more and more annoying eye problems the older I get (and no I don’t wear reading glasses… not yet anyway. Sometimes I would rather work in a very loud and crowded coffee shop than spend another minute standing at my desk in my office. And I know that I am lucky that a large part of my job involves me getting a lot of movement in my day (remember, I am also the Get-Fit Guy over at QuickAndDirtyTips.com) but I have many clients who feel trapped behind their desk and are simply desperate to find more ways to add more movement to their everyday life. So this is where the idea of “Work Zones” come into play. I will let Vanessa explain. 1) Sit-to-stand: This is where your technical work gets done and the place to put any specialty gear you require. A podcast recording setup for example. 2) Outdoor: Like the name implies we want this space to be outdoor or as close to it as possible. Somewhere with distant views, fresh air, and outdoor light. 3) Gym Space: This does not need to be fancy, just a spot with a few fitness tools and the freedom to move. I am sure your mind is already scheming, already taking stock of the benefits you will glean, the energy you will reclaim and the focus you will gain but our guests have a few more benefits. 2nd we know staring at the computer all day can cause eye strain: A great practice is take to breaks and stare off in the distance to give the muscles in the eye a chance to work. By moving outside where we can actually focus on something in the distance we offer our eyes the opportunity to work in a way that strengthens the muscles and helps prevent fatigue. 3rd. As with any job one of the greatest challenges we face is a diminishing ability to focus or stay engaged: Changing our work zone serves as a way to break up the monotony of the day and gives us a chance to feel refocused without losing productivity and time. Those are all great points but let’s get some concrete examples of how this can work in the real world. With this in mind, we like to actually move around the house into different work zones. Going from our standing work stations, to sitting at the kitchen table, to working from the various counters in our house helps us to create different positions for our bodies to move through. We include an outside work station where we can take breaks from staring at the computer screen and get some fresh air, sunlight & vitamin d to help keep us invigorated as well as calm and focused. We also have a simple gym set up where we can grab a couple sets of basics movements like squats, kb swings or pull-ups throughout the day. The gym space is a great stop over when we are working on something the requires creativity and abstract thought and strategy…getting a little movement in can help inspire new ideas or different ways of looking at old ones. If you are having trouble visualizing how this might work, I will embed a video of our Workplace Hero friend, Katy Bowman, over at workplacehero.me/workzones where she shows exactly how she moves from one work area to another in her house (she calls it a Dynamic Work Space), using different positions, levels, heights and all the stuff that Vanessa and Adam are talking to us about today. And don’t worry, she sped the video up so you don’t have to sit there for an entire hour just to see how she does this. Ok! I think we have some great ideas here which means it is my favourite time of the podcast. Vanessa, can you give us some homework? – break up the day up so that you are less bored. A yoga mat, a foam roller, some resistance bands and a set of Powerblock dumbbells in the corner of the living room that I can jump on any time I need to stretch out or raise my heart rate. I think I have it nailed! We hope you will take a look at how you can create this various zones in your workplace. Whether you work from home, are in a traditional workspace or out on the road, creating work zones has been a tremendously helpful tool for us and we think it will be for you too. I couldn’t have said it better myself. Thanks Adam and Vanessa. It was great having you on the podcast. It’s been lonely being a solo workplace hero for the last few weeks. And with that in mind, if you have a suggestion for a Guest Hero or even just a topic that I haven’t covered yet, shoot me an email at podcast@workplacehero.me. I am always happy to oblige! Workplace Hero is researched, written, narrated and recorded by me Brock Armstrong with editing help from Eleanor Cohen. Podcast logo by Ken Cunningham and original music by my band, The Irregular Heartbeats. For more information on today’s Guest Heroes, Vanessa and Adam Lambert, go to beethewellness.com (that’s with two Es) and while you are there make sure to check out their podcast. Now go make this week a diverse one. Next PostNext Are You Addicted to Workohol?